The weather at the Grey Cup seemed ideal for a late November day in Edmonton. You wouldn't know it by the state of the field at Commonwealth Stadium. The field conditions emerged as one of the main talking points in Calgary's 27-16 victory over Ottawa in the CFL's championship game on Sunday. Traction was challenging at best for players as the artificial turf surface became icy and slick. "The teams performed well and the game certainly produced a worthy Grey Cup champion,'' the league told The Canadian Press in an emailed statement. "But it was obvious the field was slippery. While the teams chose to practise indoors this week, the field was groomed on a regular basis. However, with temperatures fluctuating for days, moisture accumulated near the base of the turf and ultimately froze. It didn't seem to matter what kind of cleats the players used as slipping and sliding became the norm rather than the exception. The 56,000-seat stadium was refitted with new turf ahead of the 2015 Women's World Cup soccer tournament. The turf has a life cycle of eight to 10 years. Messages left with the stadium's building supervisor and the turf maker and installer were not immediately returned. I think the season should be moved up 2 or 3 weeks, but that will pinch the front end of the season. Here are some ideas for how to handle that problem. Many leagues have a rookie pay scale and I think the CFL needs to go to that. The first overall pick gets X dollars for Y years no matter who he is or who takes him, etc. This takes out the negotiating period between the draft and the start of training camp. And once the rookie contracts are standardized I would take some inspiration from the AAF on another point. The AAF has players sign with the league first and then it assigns contracts to the teams. That could be a way for us to deal with the problem of players who get drafted and then don't sign in order to try the NFL. After the NFL draft we could have a gap of a few days where players could find out if they were drafted, or were signed as priority FAs, and decide if they want to keep trying, and then players would have to sign a contract with the CFL to ender the CFL draft. The players who don't do this would either be bumped to next year, where they would have to do the same thing, or perhaps there could enter the supplemental draft, or perhaps there could be a second draft of some sort later on in the season. This way you would know that the person you drafted was coming to camp, because they would have already signed a contract with the league. You might want to tweak this and say that it only applies to players drafted in the first say two or three rounds. This would allow later lower wage players more options, but if they hold out or don't sign it's not as big a deal as it is if you can't sign a high round pick. You could even maybe offer these high round guys guaranteed money for at least the first year as a carrot. 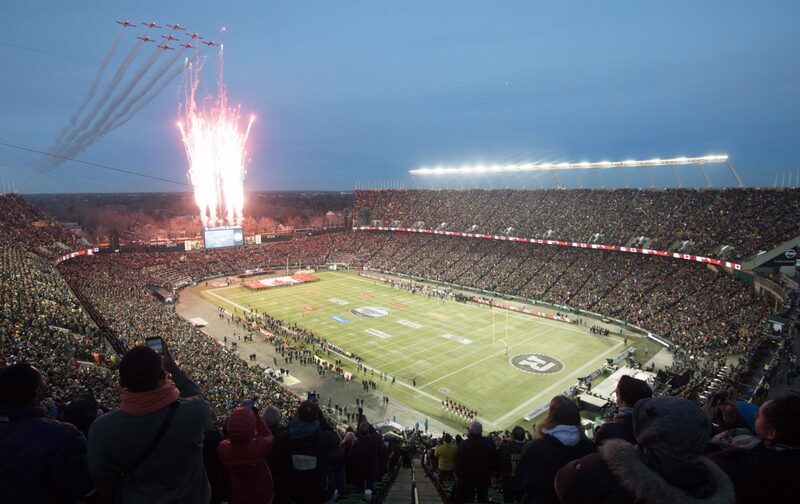 The Grey Cup should be played no later than the last Saturday in October. Granted there could still be cold weather and snow but there is far less of a likelihood than the end of November. This will also be one less month to compete against the NFL on TV (which is now getting higher ratings than the CFL). Start the season at the beginning of June and maybe reduce the schedule to 16 games instead of 18. Does a 9 team league really need 18 games? The fans across the league are voting with their feet/seats by staying away in droves from late October/November games, even the Riders can't come close to a sell out in October anymore and you have to think it is all due to the weather. What's the big deal? Edmonton has always boasted "the best ice surface in the league."